League Two promotion-chasers Wycombe marked their 1,000th Football League game with an exciting win at Luton. Sam Saunders' shot deflected in off Town defender Fraser Franks to give the visitors a third minute lead but Elliot Lee quickly equalised from close range. Paul Hayes restored Wycombe's lead with a penalty before flicking the ball to Alfie Mawson to crash in the third. Lee volleyed Luton's second before the break but could not stop his side falling to their fifth straight defeat. The result helped Wycombe strengthen their grip on third place in the table by opening up a four-point lead over fourth-placed Bury. Luton's Kenilworth Road home was renamed the Prostate Cancer UK Stadium for the night in support of the Football League's official charity. And the 8,379 fans in attendance enjoyed a thrilling first half. Saunders' opener came after Luton failed to clear a corner and his shot pinballed into the net. 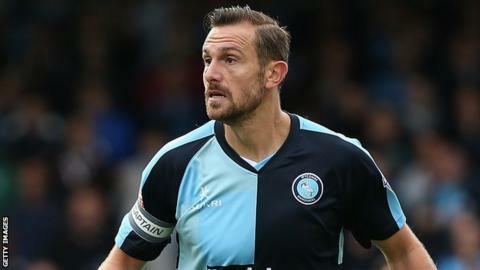 Lee levelled after Wycombe goalkeeper Matt Ingram spilled the ball but Hayes put the visitors 2-1 ahead from the spot with his 11th goal of the season after Luke Wilkinson had fouled Matt Bloomfield. Defender Mawson increased the advantage after a powerful run from the halfway line, with some assistance from Hayes, before Lee kept the Hatters in the match by scoring from eight yards out. Both sides had chances in the second half, with Sam Wood twice going close for Wycombe - who held on to seal their 11th away win of the season. Match ends, Luton Town 2, Wycombe Wanderers 3. Second Half ends, Luton Town 2, Wycombe Wanderers 3. Substitution, Wycombe Wanderers. Steven Craig replaces Paul Hayes. Paul Benson (Luton Town) wins a free kick in the attacking half. Michael Harriman (Luton Town) wins a free kick on the left wing. Foul by Aaron Holloway (Wycombe Wanderers). Foul by Nathan Oduwa (Luton Town). Corner, Luton Town. Conceded by Matt Ingram. Attempt saved. Nathan Oduwa (Luton Town) left footed shot from the right side of the six yard box is saved in the top left corner. Attempt missed. Luke Wilkinson (Luton Town) header from the right side of the six yard box is close, but misses to the right. Nathan Oduwa (Luton Town) wins a free kick in the defensive half. Attempt saved. Matt Bloomfield (Wycombe Wanderers) right footed shot from more than 35 yards is saved in the bottom left corner. Substitution, Luton Town. Mark Cullen replaces Elliot Lee. Substitution, Luton Town. Nathan Oduwa replaces Cameron McGeehan. Luke Guttridge (Luton Town) wins a free kick in the defensive half. Sam Saunders (Wycombe Wanderers) is shown the yellow card. Foul by Sam Saunders (Wycombe Wanderers). Corner, Wycombe Wanderers. Conceded by Steve McNulty. Attempt missed. Matt Robinson (Luton Town) right footed shot from outside the box is close, but misses the top right corner. Substitution, Wycombe Wanderers. Aaron Holloway replaces Fred Onyedinma. Attempt missed. Elliot Lee (Luton Town) left footed shot from outside the box is just a bit too high. Attempt blocked. Elliot Lee (Luton Town) right footed shot from the left side of the box is blocked. Marcus Bean (Wycombe Wanderers) wins a free kick in the attacking half. Corner, Luton Town. Conceded by Matt Bloomfield. Attempt blocked. Paul Hayes (Wycombe Wanderers) right footed shot from outside the box is blocked. Attempt missed. Sam Wood (Wycombe Wanderers) left footed shot from the left side of the box is close, but misses to the left.